Opens a dialog where a filter can be defined. This filter will filter the application data before it is presented in the chart. 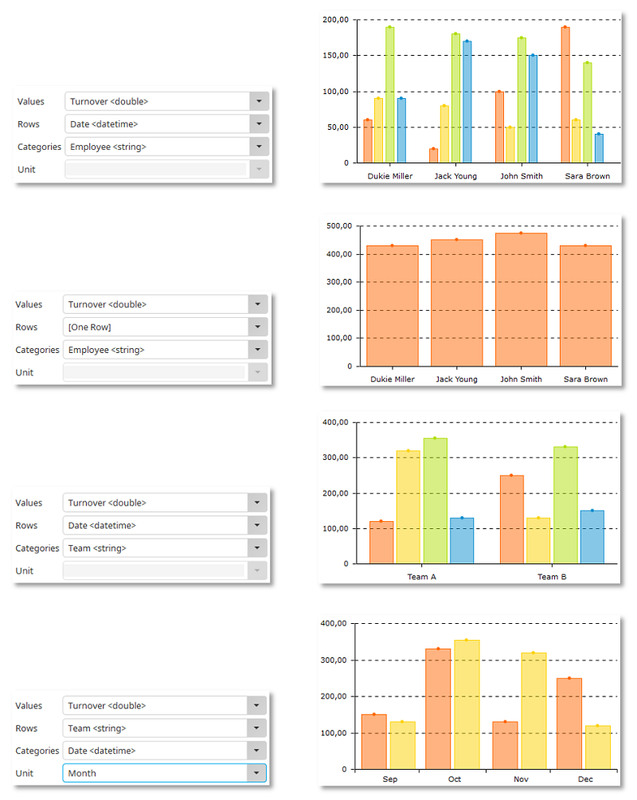 Select the data group whose values should be shown in the chart. 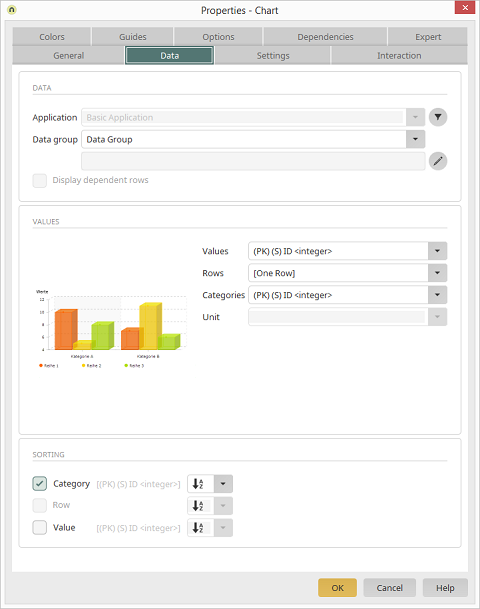 Opens a dialog where the subordinate data groups, whose data should be included in the chart, can be selected here. This setting affects the way records that exist in a parent-child relationship to the superior, currently selected data record will be shown. Here, you will see the selected chart type. Here, a field should be selected that contains a meaningful value. The values of this field will be automatically summated. This sum defines, depending on the type of chart, the height of the columns, length of bars, or size of the areas in the chart. Negative values can also be displayed, in that the individual rows will then be shown in the bar chart below the row axis. In this drop-down list, you will define by which criteria the values will be arranged on the x-axis (horizontal axis). By selecting "[One row]", which can be chosen for all chart types other than the pie chart, the "Values" are summated. Here, a field can be selected that should be used to group the data in the chart. For categories of the date type, a corresponding "Unit" (Second, Minute, Hour, Day, Week, Month, Quarter, and Year) can be selected for display in the chart. 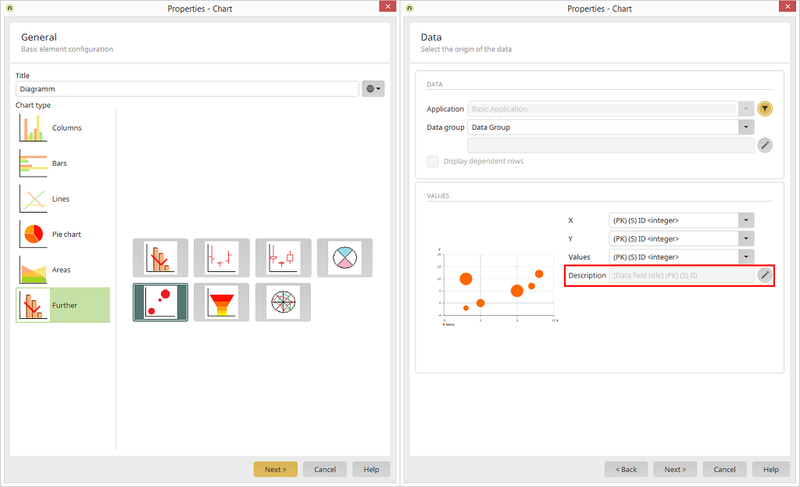 If required, a data field can be selected in the lower area of the dialog, by which the chart is sorted. You can also define whether the sorting occurs in ascending or descending order. The following example shows how sales by employee in two teams can be recorded and displayed in various ways. For the XY chart, which is available under the "Further" chart type, the description of the values can be edited.